Today, courtesy of Yvette Stanton, I’m giving away another copy of Portuguese Whitework: Bullion Embroidery from Guimarães. If you’d like to know what this book is all about, and what it can teach you about hand embroidery, you’re welcome to read my review of this book that focuses on a beautiful whitework technique. 1. Leave a comment below, before 5:00 am (Central Time, USA) Saturday, June 16th. You can click this link to go directly to the comment form on this article. The give-away is now closed – thanks for participating! 2. Please make sure you leave a unique name either in the “name” line on the comment form or as a signature on your comment. If your name happens to be Sue, for example, to distinguish yourself from another Sue, you might put “Sue in Oregon” or something to that effect. What’s your favorite type of needlework and why? I’ll draw for a winner on Saturday morning, nice and early, and announce the winner some time that day. If you happen to be the lucky one, you’ll need to drop me a line with your mailing address. May 7, 2012 Portuguese Whitework – Book Give-Away! May 2, 2014 Guide to Hedebo Embroidery – A Give-Away! October 18, 2016 Early Style Hardanger – A Give-Away! I love to do red work and that’s my favorite. Fascinated by the various lovely stitches used in White work and the beautiful outcome, I have been thinking of starting few white work projects. this book would be best suited for that . I love embroidery because it is so versatile. Saturday is my birthday and I would love to win this book! What a tough question. I’d choose crewel. Perhaps because I’ve never had an opportunity to try goldwork, blackwork and whitework. I’d love to win this book if I deserve to. What a windfall that would be! Would love to win this book – it is a technique I want to study. Red work is my favourite. I love it for its simplicity. I love embroidery, cross stitch, old fashioned Bargello- all associated with the happy memory of a disabled Aunt teaching me when I was 8 years old! –numerous years ago! I haven’t yet discovered what my favorite type of embroidery is. I’ve have tried drawn thread, black work, cross stitch and have loved them all. I started embroidering three years ago so am still in the process of discovery. I learn new techniques from books so would dearly love to have this one. I love embriodery and cross stitch. Thanks for this lovely gveaway. I love Crazy Quilting. The freedom to mix and match color and texture based on the random placement of fabrics is exciting to me! I don’t think I have a favorite kind of needlework yet, though I’m really a beginner when it comes to anything other than cross-stitch. I haven’t yet had a chance to try much other than that and some very basic embroidery. You’re asking me to pick a favorite . . . that’s HARD! I guess I’d have to say stumpwork, because it uses so many different stitches and makes me think in three dimensions. I also have been having fun lately incorporating different pulled and drawn stitch techniques into my designs and would love to add some white work techniques to my reference library. I’ve heard lots of good things about this book (and author) so put me in the running on this drawing. Thanks so much for offering it, and everything else you do on your website and blog. Adoro bordado crazy porque podemos aplicar todos os pontos e quantas cores queremos, é livre e é muito mais divertido! Obrigada por mais esta oportunidade! Fantastic book! Would love to have it and use it in my crafts. I am getting crazy about white embroidery. My favorite needlework is any type of lace making, be it knitting, tatting, crochet or bobbin. Would love to try whitework. Thanks for another chance to win this gorgeous book. Blackwork. I love the sharp, graphic look of it. Needlework has always been a large part of my life but I have never done whitework. The old pieces of whitework embroidery are so fabulous. I would very much love to try to replicate some of the work they did. I don’t know how old some of the things are that I have but fairly old. The early stitcher’s did such lovely embroidery, this book would help me to try and do as well as they did. I am new to all things embroidery. Have admired it for years and would love to learn the techniques in this lovely book. Thank you for the give-away and the opportunity to be included in the draw. Having had the opportunity to purchase some now cherished whitework while visiting the UK, I would LOVE to have a book to cherish as well. Thank You for offering this!!! I love most forms of embroidery but to choose just one I would have to say whitework. I would love to try the Portuguese Whitework. The book looks excellent. This is one book that I really would love to have. I love white on white in any form and this one especially appeals to me. Also, it looks easy enough to accomplish! How elegant. This truly makes a forever heirloom. My favorite needlework is creating a tiny sweater or rug for a dollhouse completely in French knots! Yup, a rug can measure 2 1/2″ x 5″ all in french knots, this takes about 1800 french knots per square inch. That’s a lotta knots! I’d love to see some of these. I love bullions, but I’ve only done them on children’s clothes. Would love to win this book! I love red work. The clean lines and simplicity fascinate me. Fancy-work – needlework using stranded or perle though love the feel of wool on wool for crewel embroidery. I love doing insects – dragonflies, butterflies (side on), crickets, grubs. Since I love variegated (Cottage Garden) threads the creature bullion is always a surprise. I love roses. The longest wrap so far was 156 for Noah’s Ark. I would love Yvette’s book but can I just discipline myself to white for once. Thank you for the giveaway Mary. I love counted thread embroidery with a variety of stitches. i love hand embroidery,have done some Indian types too-like katha kasauti and kutchi. now trying my hand at Hardanger,and cut-work.now a chance for whitework? My favorite type of embroidery has always been crewel. I have enjoyed your daily postings and have recently had the urge to own every embroidery thread I can get my hands on ( ! ) and to try some new techniques. I have a beautiful white work baby doll blanket that someone made for me when I was a child. After reading your posts and seeing such interesting pictures I have the white work bug now and would love a book to get me started. I have done all types of embroidery over the years but presently I am trying to acquire a certain dexterity in thread painting. Trish Burr is a great teacher for that. Portugese embroidery is my next goal and winning Yvette Stanton’s book would be wonderful since it is not available around here. Have a great day. Mary, I love silk ribbon embroidery and embroidery with beads. I am doing embroidery on a crazy quilted bear at this time. Whitework looks interesting as well as challenging and would be lots of fun to try on an all white bear. I have 2 favourites that are very closely linked – needle painting and stumpwork. There is a huge degree of satisfaction for me in completing a piece stitched in either of these techniques. The more I stitch the more I am amazed at how lifelike embroidery can become. These are closely followed by whitework though, and I usually have at least one piece on the go. So winning this book would be just wonderful. Thank you for the opportunity. I love embroidery. Over the past year I’ve been experimenting with using embroidery on a few different types of quilts. Of course, I love beautiful crazy quilts, but I’ve made an heirloom baby quilt, not using any machine embroidery like many of the heirloom quilts are made. I hand embroidered it and I’ve made a heavily embroidered wool quilt (for the wall). Right now I am working on a quilt using parts of antique linens and… I want to do whitework embroidery on it. I would absolutely love to learn more about Portuguese Whitework so I can use it on this quilt! Thank you for offering these giveaways! I quilt, do embroidery, crewel work, latchhooking and sew. I can’t say which is my favorite, just whichever I am working on at the time. Seem to have one of each going all the time. All of these skills were taught to me by both grandmother and Mom. Working on them brings me closer to those 2 strong and wonderful women and gives me a feeling of generational continuity. I am teaching my granddaughter to do these things. I haven’t tried this particular type of needlework, but always want to try new methods. I love crewel work. I love the variety of colors, the ability to do some really neat blending and the linen twill. I love your blog and have learned so very much! This book looks fasinating and I want to learn this technique. I do crazy quilting so I love to incorporate lots of different stitches, silk ribbons, lace and other embellishments into my work. thanks for provide us with your comments and instructions! My favorite type of needlework is whatever I am working on … I have been smocking for many years but also enjoy hardanger, embroidery to embellish a piece of clothing, sewing my own blouses with many variations…. I just like to have a needle in my hand and an idea in my head. This book has already caught my eye … what exciting stitching I can do! my favorite is redwork embroidery. or blue or green. it’s simple easily transport. I just done a set of Now I lay me down to sleep blocks for grandson in blue thread #517. now just need to put together in baby / toddler quilt. Embroidery has always been my first love. My mother taught me when I was very young and provided me with the materials to explore it further. I have since explored many types of needlework and have enjoyed the experiences as well as the projects I’ve completed. I really love the long history embroidery has endured and the vast applications it has. Embroidery blends well with other needlework as well. A tunisian stitched afghan can be enhanced with embroidery, a quilt can have added charm when embroidery is added to the blocks and hand quilting is basically embroidery to begin with. And of course, embroidery can stand on its own as a type of needlework. I love all forms of needlework and am constantly teaching myself new techniques but my love of needlework all started with my introduction to embroidery. This question is like asking me to pick a favorite child! I cannot answer. The two things I like the best are counted canvas work and multi-stitch samplers. At least that’s my answer this morning. If I win this book, I’ll be donating it to my EGA Chapter library. I am currently stitching Luzine’s Happel’s Schwalm Whitework project, it has me curious to learn more about this type of stitching. Yvette does beautiful work and her bullion stitches….well is there a word for needlework like that…perfection, maybe? Thank you Mary, for introducing me to Whitework and for sharing the inspiration of truly excellent needleworkers. It is through their example, we strive to do our best work. I do several kinds of needlework, but I think hand embroidery can be so creative. Taking a blank piece of fabric and adding a variety of stitches…..I love learning new stitches. I’d be happy to get this book to learn more! A difficult question to answer. I love ‘Bordado de Viana do Castelo and Drawnthread work, but I guess I do love drawn thread work more!! My grandmothers used to do it, and I loved using those sheets. I do smaller things though. Its like working out a puzzle, and if you were careless enaugh to pull extra threads, its fun redesigning, and a pleasure to watch as it takes form. And the the weaving is so soothing!! Just love it. I have been experimenting with both Italian whitework stitches and Irish whitework (Mountmellick) projects over the last two years and have just seen my first piece of Portuguese whitework. WOW!! There is so much in common in this pieces but also so different. I would love to continue my “journey” in whitework with this book. Thanks for the opportunity to comment. My favorites in stitching are Hardanger and quilting. Enjoy your reading your email posts. I love doing anything in embroidery. I love all of the different embroidery stitches. I have just started doing some redwork. I would love to win this book and try this also. I love blackwork! Although I really enjoy other types of work, there is something soothing about seeing a pattern emerge from simple monochrome and simple stitches. It can be used in so many different applications too! I’d really love to try my hand at this whitework too! I love the look of all hand embroidery. Used to do a lot of Crewel and Counted Cross Stitch. Have recently gotten interested in adding all kinds of Stitchery to my quilting. Love the combination of arts. Through your emails I have become interested in these other – new to me – styles of Stitchery. Can’t wait to try new things! Thanks for another opportunity to win this great book. My favorite type of needlework to do is Crewel embroidery. I love the bold colors and texture you can achieve with various stitches. My favorite needlework to look at is Ayshire embroidery as found on mid-nineteenth century Victorian christening gown as found in the UK. The skill of the stitcher, the variety of fillings and the designs are all amazing to me. How did these women, and children in many cases, do such fine work without artificial lights? It boggles my mind. I think this book would be a wonderful addition to my bookshelf. The whitework on the cover is just beautiful! I forgot to say that I don’t have a single favorite type of needlework I think they are all beautiful and fascinating in their own way! My favorite type of needlework – all of them! No, I really think that I lean towards anything counted. I have an affinity for symmetry, so anything on a grid, for me, is wondeful. Hardangar, blackwork, pulled, etc……..That is not to say that I don’t like other types of needlework. I have tried nearly all techniques and keep coming back to my counted grids!!!! This is one I haven’t tried as such, but I have used the stitches in other things. To learn to put them together in this way would be very interesting. Thank you for the opportunity of trying, Mary. My favorite type of needlework seems to be whatever I’m working on at the moment. Why? becasue i love diversity and also the challenge of something new. Right now my first pulled thread work, recently presented at our chapter of The Embroiders’ Guild. I’m doing the second small piece — originally desgned for a pincushion, I plan to use them as keepable greeting cards for family and friends. My favorite needlework to do is crewel embroidery because of the texturex you can acheive with the various patterns. My favorite embroidery to view is Ayshire white work as found on mid-nineteenth century Victorian christening gowns from the UK, The variety of patterns, the fillings, the skill of the needleworker I find amazing. Especially since these were usually women and children living in humble circumstances without artificial lighting. Amazing! My favorite stitch so far is the stem stitch but you see I am a novice stitcher and I come to your site so I can learn that there is so much more to learn and try. Thank you very much for teaching us and having this giveaway. Adoro bordado de Guimarães, mas os meus bordados favoritos são os “lenços de namorados” de Viana do Castelo, Portugal, pela tradição, cor e alegria dos motivos, conhece? I find sewing by hand is very satisfying, although I do use a machine for large projects, so I would have to say that my favourite needlework style is whatever I’m currently working on! And I love books on any kind of sewing. Even if I never make the patterns I enjoy leafing through for inspiration. Having spent 18 months on a very colourful applique sampler, I’m now on small and monochrome! My favorite type of embroidery has to be freeform surface. I only know this and cross stitch. I read an awful lot about other types, but I’m still learning about the ones I have a little experience with. I feel a little lost. Like I don’t really know what I’m doing. I taught myself not really following a single source of instruction. I’d like to learn a different type in a more structured way. Start over sort of. And this Portuguese whitework is very different (an exciting challenge). I like that it incorporates drawn thread and whitework (2 new things!) but there are only a few stitches to use. From your review, I think I could handle it. And AND no one I know does it. So the uniqueness is appealing. Thanks for the additional giveaway! And thanks for asking that question. It incited a little introspect. My favorite type of needlework is what ever I am working on at the time. Right now I am doing a lot of smocking and embroidery embelishments to my granddaughters outfits. The one type I have never done but have always loved and wanted to learn is White Work. It would be so exciting to add this to my collection and use some of the techniques in a christning gown for our next grand child. The book is informative. In the caribbean I do some whitework but these are lovely, and the instructions are clear. What a wonderful book. Cutwork, hardanger,drawn thread I love it all. Nothing like the joy of creating with such delicate techniques. Thank you for the chance to win a book that will benefit any cutwork lover. I would love to see more of this work. The talents of yesterday have gone by and will be soon forgotten. My “favorite” changes depending on my mood and what has most recently caught my fancy. But regardless of the technique, my preferences almost always tend towards the traditional techniques. . .whitework, blackwork, stumpwork….the list goes on and on. You are so generous with your time, your expertise and your books! I love any lacy raised embroidery, and being able to use a variety of stitches and materials. White work always reminds me of my family’s village in France and the linens they used to have. I’d have to say it’s a toss up between hardanger and cross-stitch. I know cross-stitch isn’t the most challenging of stitches, but it’s very satisfying to me. I frequently toss in a few other stitches for fun, but I love the flexibility of cross stitch. As with threadpainting, the stitch is secondary to the move of colors – if it’s done well, the stitch itself simply disappears. And I love hardanger for it’s purity and because it’s part of my heritage. Picking up additional whitework skills makes sense, as I believe hardanger was deepened as women were brought back to cold Scandinavia by the Vikings (how’s that for bodice-ripping, romance-novel stuff?). I agree with the other readers, it is difficult to pick a favorite. However, I love Hardanger with it’s precise outline and as another form of whitework, has the same monotone simplicity and beauty. This book would be a welcome addition to my embroidery library. Amazing work, with so much history behind it. My grandmother had skills in white work, and I too have the desire to learn this beautiful art. Thanks for sharing. Must have made an error in my address? sorry. Favourite type?? That is too hard! It is just whatever I am doing at the moment – which right now, is a blackwork sampler! But after I am on to the next project, who knows! I love surface embroidery on children’s clothing from day gowns to smocked dresses. An anytime I can add a touch of handwork to a special garment I embellish !!! Thanks for another opportunity. I love cross stitch and embroidery with beads and ribbon. My favorite type of needlework is English smocking. I love how it manipulates fabric, shaping it, gathering it, etc., and yet it still includes the beautiful embroidery that just adds to the art. I love all kinds of needlework, and I am always interested to learn something new, or improve on techniques I already know. I have long appreciated Portuguese whitework for it textural appeal. I would love to have thie book to learn more about it. My favorite embrodery type is Crewel. I just love the different stitches and colors. I’m learning a lot from your daily emails and share them with my embrodery friends. For a long time now I wanted to learn Whitework and this book on Portuguese Whitework seems to be the perfect opportunity. Héééél graag zou ik inaanmerking komen voor dit bijzondere boek. maar er is al zoveel belangstelling, zodat mijn kans wel erg klein is. Juist deze vorm spreekt mij nu bijzonder aan,na Wessex Stitchery, canvas,vr4ij borduren etc. Het boek is WELKOM!!! Thank you both for this special opportunity. White and cream on same or each other have always greatly appealed to me. I probably would say though that freeform embroidery, which incorporates a good many types of embroidery including made as you go what-evers, and whitework techniques too, is my favourite. I just start with a smallish piece of fabric and stitch, tuck, stitch, gather, spread, stitch, stitch, stitch, sort of thing. I like those soft upholstery type fabrics that are a different colour or tone on front and reverse. With some folding over, both sides can be incorporated and it can become sky and land or sea etc. Two pieces of fabric can be basted together to get the same effect or better with one textured/patterned. Little beads add dimension and mystery, tucked into a ‘creviced’ tuck. Sorry, not ‘sposed to be a runaway how-to. Yeah, small freeform pieces. I used to love to watch my grandmother do whitework. I should have taken the time then to learn it from her but I was a kid and my thoughts were not what they are today. I do have to thank her and my mother for teaching me the basics of embroidery and the enjoyment I get from doing it today. Whenever I embroidery I think of both of them and it brings back a lot of good memories. Now when I look at whitework, tatting and some of the other skills that not everyone can teach you I think of my grandmother and the lost opportunity I missed out on as a child. I am trying to pass on what I have learned to my children and grandchildren and would to learn new skills to pass on to them. I love to read books especially those that give instructions on things so I can learn some of the beautiful stitches I used to watch my grandma and mother do. Why do children wait till it is too late to learn from the ones that have mastered the skills so well? I forgot to add my favorite to do is the basic embroidery because you need that fondation to learn all the other stitches. Counted cross stitch for me! Although I do love experimenting with different kinds of needlework. I have been studying Berlin Embroidery lately and do mainly canvas work, but I’ve been thinking that some whitework would make some great table linens. I enjoy almost all counted techniques, especially Hardanger. Any book by Stanton is a worthy addition to a needleworker’s library. That is a tough question but… I must say Castelo Branco is my favourite embroidery… I just love it! Thanks for this new chance at this book. I am in the process of gathering textiles for white work .Keepsakes to be given to my daughters. My way of passing along beauty and a bit of history .white work has my attention ,as I am trying to learn from books and your review was very encouraging.I appreciate this chance to receive this wonderful book. I have not done that much needlework in the past, mostly kits for LeeWards. Crewel work with the 3D effect always attracted me. I guess as I get older and busier, stretching my artistic side as a diversion is looking more attractive. I have enjoyed Machine embroidery, but you can not be a part of the family if the Machine is in the other room, crowded with other machines/mechanical stuff and computers….they are the colder/harder family members. Hi Mary. I’d love to add this book to my library as I’ve recently fallen in love with hand embroidery, and I’m interested in learning all about every style. I’m not sure I could choose one type of needlework as my favorite as I needle tat, knit a bit, and now have been doing embroidery for about a year and a half, but if I had to choose, I’d say needle tatting. I’ve completed one white CQ piece, and have another started. Portuguese Whitework would certainly give me more stitching variety! Thank you for the opportunity to win this book. It’s that simple? LOL. Right now I am finding choosing a favourite to be very difficult! While cross stitch is sort of my default stitch, when I need something easy, I think the most honest answer is that my favourite stitch is the latest one I have learned. So I am very eager to improve my bullions and branch out with whitework, and because I already have one of Yvette’s other books, I know I will be in good hands with her! My favorite kind of needlework is the kind I feel really proud of when finished. The simple, colorful embroidery women have used to personalize their homes always pleases me, no matter the style or level of skill. Please please please! I love her books. Have now been following her blog and got her other book (Ukranian) and going to do it! Then I can skip countries and to Portugal! Love your blog and info Mary. You do a great service to the handwork community! My favorite type of needle work to stitch is shadow embroidery. I love the look of colored thread showing through the fabric. I have made several baptismal gowns with white on white. I love that look as well. Your web site is a treasure trove of information. I really appreciate all of your hard work. Whitework and silk/metal thread embroideries are my favorite — both for the way light reflects off the threads and thread directionality to create shading and other effects. I also really appreciate the challenge of working an all white piece, yet achieving so many varied visual effects. With silk/metal thread, it’s all about the tremendous colors available and the “glitz” of the gold (and other metals)! Thank you so much for these various opportunities to LEARN and PRACTICE. Bullion stitches are my nemesis and I keep trying. Practice makes perfect and what a way to maybe pick up some good tips. Thanks so much for broading my knowledge. Something I don’t know how to do and what a GREAT opportunity to learn how to do it. Would love to win and give it a try. I have always loved whitework. In fact, the first class I ever took was whitework. However, I am beginning to move into the crewel arena. Cool, give away! Thank you and Yvette Stanton for doing this. My current favorite needlework style is blackwork or rather monochrome work. I like how limiting color choice causes the embroiderer to concentrate on motif, stitch and texture. I’m even more entranced by how limiting color and stitches can emphasize the beauty of a design rather than obscuring it. It’s like distilling the essence of a flower and receiving a bouquet in return. Thank you Mary for another copy of Yvette’s book..wish to win.. I love all types of needlework but my passion is counted thread samplers. When designing I add other types of needlework to my samplers such as stitches commonly used in Needlepoint or Crazy Quilting. I have tried almost every type of needlework but always come back to samplers. Mary, My favorite type of needlework is surface embroidery, and crewel embroidery. I also like to do punchneedle once in a while. This is so lovely, it would be a great addition to any collection. Thanks for sharing it with us. My favorite type of embroidery is Brazilian Dementional Embroidery but I don’t do it as much as regular embroidery. I love doing the bullion stitch. Between you and Yvette Stanton my embroidery has greatly improved. Just watching your tutorials and going back to Yvette’s left handed directions I’ve been able to accomplish a lot. I’d really love to win Yvette’s book on Portuguese Embroidery. The cover gives me goose bumps so I bet the insides are pure ecstacy. Pleae exclude me from the draw! I already have the book and it is excellent! My favorite type of needlework is crewel – and I can’t wait til october when I will learn from no other than Philippa Turnbull – wow!! some whitework. Thanks for the chance to win! I love embroidery with its myriad of stitches and techniques which I use for a multiple of creations, from the clothing for my tiny miniature bears to pincushions. I was fascinated to read your earlier review on Portuguese white work and immediately started ‘googling’ to find out more. Made a note of lots of different ideas to try out in the future, the book would be a wonderful addition to my library. Hi Mary – Thanks for another giveaway. I would love to win this book. Whitework/lacework fascinate me. I do Hardanger and have repaired lace too. I also do counted thread, canvas, cross stitch, beading, temari,etc. My favorite is Brazilian dimensional embroidery because it’s challenging and the colors are awesome. There are lace techniques, stumpwork techniques, traditional embroidery stitches, and stitches that have just been invented. I have begun to combine techniques. I don’t yet know about Portuguese whitework but I’d love to! The best embroidery that I have enjoyed thus far is chicken scratch embroidery…..
Oh boy, I enjoy Needle Painting the most right now. It is because of the freedom in stitching. When your done it’s your work and there are really only “guidlines” to follow. I love that!! Thread Painting gives me freedom with my stitching!!! lace is my favorite type of needlework but i do all types. would love a copy of that book. thanks for all the good info you give us. I’ll have to say embroidery, as I get bored doing the same stitch over and over and over….even if color changes are done. Also Hardanger, loved doing the weaving bits, although snipping the fabric was a bit nerve-wracking. Cross stitch is my favorite because you can embroider such deailed pieces they look like photographs. My favorite type of embroidery is thread painting. I love the way the colors melt into each other and create realistic designs. I thinks it’s calming and beautiful. I would say Hardanger is my favorite right now, but I’ve never tried whitework. I like the delicate lacy look of hardanger pieces. Thanks for offering this giveaway! Oh what a beautiful book and I would like to be the one that gets it. I love white work. It is so relaxing not to have to change colors all the time. Please, please I hope I get it. This is a worthwhile book to own. This question is a tough one; I suppose, my preferences change a bit. I used to love doing Richelieu, than during a couple of years I did a lot of puncetto needle lace and now I am doing some portuguese embroidery, although not the Guimaråes embroidery from the book (but Castelo Branco). I think my next project will be a reticella piece. Hardanger too, is pretty, or blackwork or… there are just so many different styles, it is hard to choose. But of course I would love to learn more about the embroidery style described in the book, as it looks just beautiful! I love whitework embroidery. The simplicity, the organic look and the purity of the work, I love all of it. But the beauty of the work is also in the technic and in the choice of the material. An another book of whitework in my librairy, would be great and a good occasion for me to learn an another technic. I love Richelieu embroidery because it makes a relief over the fabric. One? we must choose only one? …:::sighs:::… I’d have to choose Hardanger then for its pure texture without the distraction of color. You’ve missed my birthday by only one month (May 13th), but having this book would make an excellent apology. Excellent give-away ~ thank you! I would love to own this book – in fact it has been on my wish list at Amazon for a while now but it is an extra for the time being. However, our guild is studying all forms of whitework next season so it would be a great addition to my library or the guilds. I have been embroidering for years but I am relatively new to the guild and I am learning all sorts of great things. I enjoy whitework. I love learning new types. This would be a wonderful book. Thanks for the oppotunity. I enjoy surface embellishment using free style hand embroidery – using a variety of stitches to suit the piece. Favorite type of embroidery? You must be kidding!!! I don’t know any that I really DON’T like. And there is an embroidery for every type of mood — sometimes I like the challenge of small, intricate single-strand silk embroidery. Then there is the “quick-and-dirty” of bold Arts & Crafts style with perle cottons. The theraputic “no-brainer” of cutwork embroidery — how many thousands of button-hole stitches can I make in an hour? And the predictable thrill of following a counted cross-stitch chart. And there is ALWAYS the “discovery” of various ethnic embroideries — which is why I would love to have this book! Maybe I’ll be the lucky one THIS time!! There are so many interesting types of needlework that I can’t narrow this down to a favorite. In a couple months I will be taking a white work class, my first. The book looks lovely, but I would really like it for my friend who will be teaching the white work class and loves white work. My current favorite form of embroidery is stump work. It is such fun to incorporate a variety of embroidery techniques and work in three dimensions. I love the historical pieces that told a story and modern ones that contain visual surprises like a tiny bug hidden in the leaves oF a flower. So much of life is serious. This wonderful form of embroidery is delightfully playful. Thanks for your wonderful emails. Your work is so inspiring and your how to’s are beautifully clear. I enjoy all types of embroidery which is why I crazy quilt. It lets me be free to do whatever type and style of embroidery possible and it all looks great together. This book would only serve to give me a basis for yet another type of hand work. What an excellent book. Exquisite examples well photographed with some good projects. It really promotes whitework and hand embroidery. thank you for your review and bring it to our attention. I don’t have a favorite. I like all needlework. My favorite type of needlework is stumpwork – I’ve just seen amazing pieces that can be so stunningly real. It lends itself to creativity as well since you can figure out how to portray just about anything in embroidery with the additional dimensions. My favorite forms of embroidery are openwork and drawn thread work, with Hardanger being at the top of the list. A close second is silk ribbon work, and often my projects combine touches of both. I’ve not had the pleasure of trying this beautiful Portugese whitework, but would love to try, especially as we’re supposed to be taking a trip to Portugal in early spring 2013 if all goes well. I love all kinds of needlework. I am always eager to learn some new techniques as well. And I do believe this is a great giveaway. So I would love to win this book. This is a beautiful embroidery I would love to learn!! Thanks for the chance! Right now my favorite is blackwork, since that is what my current project is. But I would love try to Portuguese whitework! I love any needlework that is extreme in detail…white work, gold work, dimensional stump work, knitting, etc…everything you do becomes heirlooms and pieces of art. My favorite type of needlework is embroidery enhanced with color crayons. The shading of the crayons gives the embroidery a subtle hint of color without having to do applique. Thank you for the chance to win this lovely book! I’m from Israel it is allready half a year since i became a member of your mail list. I enjoy every moment of reading . My most intersting is in white emberoidery from the world. Yvette Stanton is my favorite and I have a lots of her book. Hope to get it and learn to stich this interesting work. I do love Hardanger embroidery because it looks so crisp and clean in white – as does this portuguese whitework; beautiful. My favourite needlework to do is crewel. But every time I see whitework I’m overcome with desire. And I think, if only I had some good instruction, I could make something like that! Portuguese whitework is particularly appealing to me because of all the bullions. I love the texture! As always, thanks for wonderful giveaway! Have been doing embroidery and counted cross stitch for so long but would love to learn all of these other beautiful stitches. It would be so exciting and rewarding. I was annoyed at myself for not submitting a comment last time you gave this book away, thank you for another opportunity! I’m a newbie to the sewing/needlework world, I’ve been a knitter for 45years but have always wanted to add this exquisite craft to my repertoire. I stumbled upon your site a few months ago and immediately created a folder on my computer where I place all your mailings. Some of the books you have referenced have whetted my appetite and have encouraged me to begin a project. I also enjoy your style of writing, keep up the humor! BTW, LOVE your Medallion! My favorite type of embroidery is silk shading. Thank you for this opprtunity. Have a beautiful day! My favorite type of needleword is Brazilian embroidery. I love the wonderful colors of the rayon threads, their ability to create dimensional flowers and the actual feel of the threads as I work with it. Trying new types of needleword with that thread is something I really enjoy. I’ve been an embroiderer for many, many years, but only with the internet have I realized there are so many more stitches and types of embroidery than I ever knew about. Also, books of this quality are not available in my small town. This book would be a treasury for me. Thank you for offering it. Since a few weeks I’m started again with brodery.And it is so exciting to see that with needle and tread and some linnen we can make so many beautiful things. I thought that portugese brodery was with bleu tread only. I would like to have the book because it will give the opportunity to find out more about this beautiful brodery. My favorite type of embroidery changes with the project I am currently working on. There are so many styles of embroidery and one day I hope to be able to interpret a design and use all kinds of styles in one piece of work. i would have to say studying about all the techniques is my favorite part of embroidery too. My favorite type of needlework? Hard to say as I always love what I’m working on or I don’t do it. I’m not a big fan of counted work – too much counting and not enough creativity. I really do love embroidery where I can just stitch along and only refer to a chart for colors or placement of my stitches. So, this would include redwork, crazy quilting, ribbon emboirdery, even Brazilian – I love color. But I’m now coming to appreciate whitework and am starting to explore all forms of it. I guess my favorite type of embroidery is a piece that combines it all! My favorite would have to be redwork, since red is my favorite color! I’m fond of crewel, too, but need to do more. Would love to win this book – this looks so elegant! Thanks for the opportunity once again! My favorite embroidery technique is crewel. I love working not only with wool, but with many other threads, too. I like mixing stitches to make different textures. Glad it is becoming popular again! I do like using all kinds of techniques, too. One of the fun things about embroidery is that there is always something new to learn! I would love to try this technique…I always like to learn something new…and especially techniques I can adapt to canvas work, my favorite medium. I design my own quilt patterns for my family and friends. Embroidery is a large part of that process. Sometimes I pick a design from the fabric to recreate but I have also used free form and patterns. White work is so beautiful and owning this book would be a fantastic addition. Thank you for the chance to win. I love embroidery and needlepoint. Working with threads, textures and colors is wonderful and fine. I would like very much to learn about whitework. Thank you Mary, your tutorials are the best. Thank you for offering another book for a lucky winner. The photos are so beautiful that it makes you want to immediately start a project. Trying to expand my stitching experience and this is an interesting technique. My favorite type of embroidery would have to be Crewel, I like the richness and fullness of wool yarns on burlap, wish I could kind more kits. I am an artist and I draw on all types of fabrics, I began a Sea theme on a denim cover shirt when Free Willy came out, on a visit to Monterey CA, ladies begged me to sell it right off my back. The Art of Needlework is a love that is given to friends and family. Thanks for so many tips and lessons…my Mother taught me from her linens and table covers she did when I was a baby. Until recently, my favorite embroidery was counted crosstitch. Last year, however, I retired, and now I have time to learn other styles. I bought a whole suitcase of tapestry yarn off eBay, and a book from Amazon, and now I am teaching myself crewel. I hope, eventually, to work my way up to gold woork, as the project you did was awesome. I learned embroidery at my Mom’s knee when about 5-6 years old. Now I am 85 and loving the simple embroidery that I now do. You are the closest teacher I have and love learning from you. I am comtemplating something more than the simple addition that I am adding to my applique plus Trish Berg’s work. I can only hope that this book will be added to the few embroidery books that I have been able to acquire that are on my shelf. Thank you for your willingness to share and being my teacher every morning. I´m still just begining with needle work, but I love playing with different embroidery stitches! My favorite needlework is reproduction of 17th century samplers and lace work. Heirloom embroidery and hemstitching is one of my favorite stitches. I would love to win this book, because I’ve got some cream colored cotton strips that need those bar stitches and florals! Of course, I’d be happy for anyone who wins it, though! I am currently in love with crazy quilting. It allows for so much creativity of design and types of stitching. I would love to win the book as I am also drawn to the white work. Thanks for the chance to win. I am an avid lover of 17-18th century crewel embroidery, Jacobean is my favorite. I’ve been stitching in this style for over 40 years and simply love it. Just had the opportunity to visit Boston and see an 18th c. American embroidery exhibit at the Museum of Fine Arts. I was in 7th heaven! I would love to win the Portuguese Whitework book which highlights the Bullion stitch, one of my favorites and used in a completely different way. I’m very interested in stumpwork and dabbling into it’s possibilities now. Thanks for the book give-away chance! I especially enjoy embroidery that has historical significance to me. My grandmother taught me many needlework techniques and I love to attempt to create items that I remember seeing her cherish in her home. I do remember her pressing her freshly washed linens on the mangle (an old ironing device) and the look and smell of crisp clean linen embroideries stays with me 50 years later. This book would serve as further inspiration to create many more cherished items to honor the talents of my grandmother and her willingness to teach another generation. I love all kinds of embroidery but my favourite stitch just has to be the humble but oh so versatile running stitch. In particular I love Kantha but running stitch offers up endless possibilities. I also love whitework especially Mountmellick and Carrickmacross lace. This book would be a valued and exciting addition to my textile and embroidery library. Thank you for offering it as a giveaway. Good luck to everyone entering! My favorite is just plain embroidery but really would like to try hardanger. My current favorite needlework is crazy quilting. I am trying to learn new stitches and attempting to combine different stitches to create unique designs. It is a challenge! I do love the bullion stitch and need to add some to my cq. Hi Mary, I’d like to have this book because is not yet in Europe and I love any kind of geometric embroidery such as hardanger and ajour. Wow, just wow. This looks like a great book. I have done cutwork over the years both Schwalm and Hardanger, but have never incorporated bullions. I like the fact that Yevette has both instructional information as well as projects to this book. Looking forward to a more indepth look. Mary, as always I love your book reviews, many books in my personal library were purchased after reading one of your reviews. Thanks, again for allowing me this oportunity. Thanks Mary for sharing with us not only your expertise and knowledge, but also this wonderful gifts that for some of us is very difficult to get. I love to work on placemats since they are very useful for everybody. These days people are hesitant to wash and iron a full tablecloth… Any type of embroidery that can help on any design for placemats is always wellcome. Besides, Portugese Whitework give it a formal look and elegance not always found in other styles. I wish myself luck!! (bad boy!!) and God bless you. Gosh! This book made my mouth fly open! Beautiful stitching – would just LOVE to win this book and make that sampler or any of the other gorgeous projects in there. Have long admired whitework – guess that’s why my favorite stitching is Redwork – just love the simplicity and clean lines. Thank you SO much for the chance to win this book! I enjoy doing white work of any kind. The white on white linen so beautiful. I do Schwalm, pulled and drawn work, filet, casalguidi, cutwork and hadebo. I saw the ad for the book and thought this would so wonderful to use and expand my repertoire. I teach white work at our Guild in Guelph.. It would be awesome to use in my classes. My favorite type of needlework has to be hardanger. The next project I would like to try is a dresser scarf of Hardanger embroidery. My favorite pasttime, besides needlework, is to browse the beautiful work of others. There are some wonderful pieces of work made by some awsome artists. I only hope someday I can be in that league! My favorite is embroidery. Thank you for the generous giveaway. I’d love to win this lovely book. I recently had a good look at this book. It is lovely! The pictures and instructions look first rate and very easy to follow. She makes Buillion knots look easy and I particularly liked the part where she explains what to do when they go wrong. White work of any kind is just so beautiful in its simplicity. My favorite form of needlework changes all the time. However, drawn thread work has been the most recent technique to fascinate me. I love the open areas and the delicate threads. I gravitate toward white work,; there’s just something that appeals to me about creating color out of texture. My favorite type of embroidery is the one I am doing at that time, lol! This Portugese whitework book is lovely, I saw it in the bookstore here a couple of weeks ago, they had only one copy, I immediately bought it! And I agree, it is a wonderful book. A project from this book is next on my list, after I finish the one I am doing. I already have the book, just wanted to tell you all it is lovely. I love doing kits South Africa the best, all those beautiful flowers, insects and birds. Whitework looks just like the drawn threadwork that I receive from my husband’s relatives in Slovakia and I’d appreciate receiving some instruction on the techniques. Bullion is such a great stitch! We lived in Portugal for three years with the Air Force and NATO. I have some of the beautiful linens they make. How fun it would be to learn t sew them! Hallo, my favorite type of needlework ist drawn thread, because I am found of its “sculptural” appearence. I would like to receive the book and try the combination of draw thread and the whitework relief, it looks so beautiful . Besides of this, I feel myself bound to the portuguese needlework tradition because I come from Brazil. Thank you for offering this opportunity. At the moment I go weak in the knees for blackwork. The simplicity of designs and how complex you can make them just absolutely delights me. Whitework always looks so elegant. I haven’t tried it yet but it’s on my list and of course my list is quite extensive! Isn’t everyone’s?! Thank you for this lovely giveaway. I don’t have a favourite type of needlework. I love them all, have tried most of them and incorporate them into my work. My favorite type of needlework is ecclesiastical embroidery. I do enjoy many types of needlework, but this is my favorite because of the challenge it presents and because I am blessed to see the products I produce being used in the church. I love your Website! You have helped me learn several new techniques and the Website is an inspiration to do new projects. So many needlework projects I’d like to do and never enough time! My favourite is whitework. Simple and elegant, the options with white thread on white fabric are truly astounding and no need to agonise over choosing colours! French knots – so I suppose the answer to your question is Crewel – but I love the prospect of design adventures with French knots. I love all forms of embroidery and the Portuguese Whitework is one I have yet to explore. Please include me in the drawing for this wonderful book. My favorite type of needlework is needlepoint. I like using lots of decorative stitches and stumpwork on my projects. General embroidery is my favorite because I love to put together colors. I’ll work all in one color or work colors that I “see” in the material I’m using. OH PS. I have a very old Battenburg (sp?) lace doily that I have “tried” to mend, and refuse to part with. It looks like this book might really be helpful. ?? My favourite embroidery form is surface stitching. There’s a sense of rhythm that suits me. I like how one can still learn, after many years of embroidery, new stitches and new ways of using them. There is also history to the stitches as well as learning how stitches have been used in various countries. It seems to be a universal language among women. I have always loved to do cross stitch patterns but I am looking for new ways to do needle work. Ohhhh, exciting! I especially love quilting (both the patchwork and quilting aspects). Embroidery has become a very close second. My background is Portuguese and I’d love to give this whitework a try. My favorite is blackwork, because of the sharp contrast between the stitches and the background fabric. And the patterns can be so intricate and interesting! I am most drawn to openwork and whitework, so this is a perfect book for me. I am so glad you draw these specialty titles to our attention. I will *never* get tired of learning more, and this looks like another book that should not be missed! What a generous giveaway. I was just sending your website to a friend when I saw this give away! I love all kinds of embroidery, but I must confess the thing that got me started in it was kitschy little vintage patterns. I’m currently trying to improve my fill stitches…using your tutorials, of course! My favorite type of Needlework is counted stitch work that is not just counted cross stitch. I have done them mixed in tall “samplers” which do not have alphabets, but may have a saying on it. I can’t think what the name of this kind of embroidery is called, neither can Mary in #28. I would love a copy of this book ~ I’ve been following Yvette’s blog for some time, and would love to have instructions for this beautiful needle art form. Pick me, please! My favorite kind of needlework (at this point of time in my life, LOL) is needle painting. I recently bought Trish Burr’s latest book and I’m learning about color and shading. In my mind I have this list of techniques to learn and Portuguese Whitework is near the top of that list. I love the simple elegance of it. Thanks for a chance at winning the book, Mary. I love surface embroidery. I teach Brazilian and silk ribbon embroidery so I really love the wonderful results we can get with these mediums. I really love all hand work. My favorite type of needle work is lacy stuff like hardanger… this book would be right up my alley! Please enter me to win 🙂 Thank you for all you do! I love your site! Amo bordar! Atualmente estou bordando bastante ponto cruz, mas quando criança aprendi bordado livre e realizei alguns trabalhos com ele. Adoraria ganhar esse livro para aumentar meus conhecimentos com essa arte lindíssima. Conheci seus trabalhos agora e estou amando tudo que vejo, parabéns. I love brazilian embroidery because or the three dimensional look and colors of threads. I love to do cross stitch, but have done swedish embroidery, crewel and other things It would be so much fun to learn another form of needlework. I think this book is so beautiful. I love embrodery and my eye has fallen on the white work of late and tone on tone. I would love to have this book to get started right. Favorite needlework? That’s like favorite child! 🙂 The easy answer is either whatever I’m working on now or whatever I’m planning next. If it has history it’s high on my list, and I tend to large projects, but I also enjoy occasionally sitting down and working on a simple counted cross stitch ornament for a friend. Every form of needlework sings a different song to me. Beautiful! Would love to have this book…please enter me in the drawing!! Good Luck to everyone! I just like having a needle in my hand–cross stitch if I can concentrate, other embroidery if I am doing something else too. I love all forms of needlework but at the moment I will have to say I am liking embroidery best because I am drawing my own designs and embroidery is the medium that goes along with this best. I draw and then stitch what I draw. I love learning new forms of needlework. I have done whitework with a teacher but never on my own. I like it and would like to do more. A book sure would help. It seems that whatever I am working on is my favorite at that time. Currently I am trying out the art of stumpwork – I had never heard of it until I was looking for ideas for my Crazy Quilt. I love how it gives dimension to a project and how different it looks from other types of needlework. Would love to win this book. Looks like a nice book and a way to learn something new that I could use in church linens. My favorite type of embroidery is anything with color, but I know it is important to be able to do whitework also. I know it’s not really a type of needlework, but I love ecclesiastical embroidery. Both the opulent needlepainting and goldwork on the vestments, and the whitework on the linens. I very very much would like to win this book! Pick me, pick me! I would love to have this book to follow along with. Good luck everyone!! Often my favourite type of embroidery is whatever project I’m currently working on (satinstitch+goldwork or tapestry or drawn-thread whitework, etc), but I think the various folk forms of whitework is my favourite. I like the simplicity of white on white with the variation of stitches, the clean unembroidered portions of white linen, and the voids where threads have been cut and the surface underneath shows through. There’s just something magical about the lacy effects of positive and negative space that fascinates me. My favorite type of needlework is samplers with all types of stitches. I especially like doing smalls (needle books, scissor holders, etc) for the multitude of sewing baskets I have collected for my granddaughters. This Portuguese Whitework book is needed to add another dimension to my stitching and I have a dear friend who’s husband is Portuguese and I’d like to stitch them something special! Thanks Mary for having these give aways. I so appreciate all you do for the stitching world. how to do other kinds. I learned to embroider when I was 10 yrs old. I have gotten away from it, but would like to renew my skills. Right now my favorite type of needlework is embroidery, mostly because that’s the main project I’m working/playing with now. I also like to cross stitch, sew, and crochet. They are all so rewarding and relaxing! That’s an easy one! Hardanger! Not as “hard” as it looks, and any of my “anger” is abated when I see the beautiful results. Oh, I know, bad pun…but I love it! My favorite form of needle work is Brazilian Embroidery. I just love the dimensional aspect. My favorite stitch is the bullion, so this book would be perfect for me. I would love to learn this technique. I think that I would have to say that Hardanger is my favorite at this time. I love the fabric/linen and the geometry of the technique. Being asked to choose your favorite needlework is like being asked who your favorite child is. I like anything that has a lacey effect like pulled and drawnwork, hardanger and needlelace. I also prefer white on white in the color schemes. And thirdly, I want my embroidery to be functional as well as decorative. There is only so much wall space that you can use. I love doing “freehand” embroidery to build seam treatments for Crazy Quilts. The mix and matching of different stitches to build wonderfully complex or simple thread patterns on Crazy Quilt seams is so much fun. It’s like painting with stitch types. I love to learn new stitches and techniques and play with them. My favorite needlework is needlework. The favorite because of the variety of fabrics, threads and stitches that can be used. There is always a variety of effects and looks that I can create. It just brings out my creative feelings. As a kid I did mostly cross stitch got older tried counted cross stitch, a couple of ornaments later decided it wasn’t “me”. Kind of got away from stitching except for the Flower power jeans of the 70’s. 🙂 (aged myself there) But then in 2004, I was introduced to redwork by a friend who need patterns for a class ……It is my “go to” stitching, I used to stitch in just red or blue, but now I approach it with more modern patterns and by adding some other stitch techniques not usually seen in redwork, sometimes adding other colors but not so many that it’s like the pillowcases and doilies. I love to explore stitch techniques and fabric manipulation!! That’s what I love about your daily posts all kinds of stitch goodies!!!! THANK YOU SO MUCH FOR YOUR SITE!!!!!! Thanks also for a chance to win a book with a fabric/stitch techinque new to me!!!! Cyndi loves to stitch, stitch, stitch! Gail – from Napier, New Zealand. Thank you for offering another give away. My favorite needlework seems to the the project I am currently working on. Whatever it is at the time is my favorite. I like it that way so that I am always encouraged to finish a project and always ready to try a new method, technique or fiber art. White work as I commented before reminds me of my Grandmother’s beautiful white work linens around her home. My favorite embroidery is counted-thread–blackwork probably most (double-running-stitch border), though cross-stitch was my first needlework passion and is a little less repetitive (to get a piece large enough to be useful). My favorite type of needlework is Canvas work. I do other types (cross-stitch, hardanger, blackwork) but I get the most enjoyment from Canvas work. I have recently subscribed to Inspirations Magazine (based on your website) and am very motivated to now try a few more types of embroidery such as Whitework. A copy of this book would be a wonderful reference. I learned embroidery from my mom at a very young age. I am 40 years old and have just picked it up again after so many years. I am finishing some projects and headed in the crewel embroidery direction. Wish Me Luck!!! I am fascinated by whitework. I have several books and have read them from cover to cover. I hope to do some pieces for my church, and I have already purchased some linen to work on. I have admired this book on this site, as well as on the Inspirations web site. I love to make bullions and this book looks like it would have wonderful designs in it. I would say crewel because my first really nice project was crewel-back in high school! Needlepoint is my favorite kind of needlework. It takes little thought, after you have put the pattern onto the grid. It is kind of like coloring, only with yarn or floss, and is totally transportable! It’s a great way to keep your hands busy, while your mind is elsewhere! That’s a lot like naming my favorite child: I love them both, but each has his own pluses (and minuses, I suppose). Or like defining blackwork: it’s black, except when it’s not; counted, except when it’s not; reversible, except when it’s not… But if I must choose, I like monotone, so blackwork, redwork, whitework. But I also like colorful, so crewel and surface work, canvaswork with their great variety of color and texture. Most of all, I enjoy learning all the different varieties of needlework; this book fits right into that quest to learn new things. My favorite handwork is anything with a needle and thread. I enjoyed felted wool applique the most, cotton applique and cross stitching. I even love it when the kids come home with a shirt to sew a button on, or a seam that’s been pulled out. What a great chance to win a book. Thanks. I am a beginner to embroidery and have been self taught for most of my attempts. I have only tried a few types of embroidery so far and I would have to say I really enjoy stump work the best. I find it challenging and often intricate. The end product is always something beautiful that others are often in awe of it given that its three dimensional. I have always loved all types of sewing and have finally discovered embroidery is my thing. I would love to try Portuguese white work and see if this too can be added to my growing skills and loves of all things hand work. A favorite, oh, only one? All that give a 3-d effect, coming off of the ground fabric. Brazilian, stuumpwork, ribbon, etc. Thank-you so much for offering another give-away for the White Work book. Yippee! There is nothing better than a second chance….except meybe…winnine 🙂 . My favorite form of needlework is embroidery. All of the amazing kinds of embroidery is fantastic. I will not have enough time to try them all….. I loved how this technique includes drawn thread with the bullion knots, the dimension and textured effect are eye-catching. The pages shown in the review show excellent instructions for executing the techniques. I love drawn thread work! The technique I learned is also called Puerto Rican work and is used on baby clothes. I would love to learn Yvette’s techniques. My favorite type of embroidery is White Work. I have done a fair amount of Ukrainian White work, Hardanger, Filet work and pulled thread work, but I have no information on Portuguese Whitework and it looks very interesting. Yes! this is the book i can really use. i am about to start a white work project. i have a hardanger book but i think some of these techniques would add a lot. Please don’t make me choose my favorite, it depends on what room i’m in. knitting and embroidery in the living room, chrochet and quilting in the family room. i love learning new stitches in any medium. Thanks for sharing your wealth of knowlege! My favourite embroidery technique has to be the one I’m working on at the moment (whatever that may be)! But I do love doing canvas work, Jacobean crewel work and whitework as they all use a variety of stitches so are interesting to work. This book would be a great addition to my collection. It’s hard to choose a favourite because there are so very many great techniques to try, but I really love whitework (in all its guises!). Would love to win this book and learn how to make perfect bullions every time. Another opportunity? How wonderful! Thank you! I enjoy embroidery and crocheting and love CQing as it allows for mixing, matching and going totally crazy with textures. 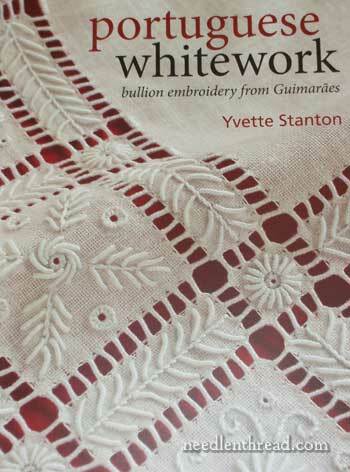 But obviously whitework is special – have done a couple of things and will definitely try something from Yvette´s book! Picking my favorite is very difficult, but at this time I think it would be cross stitch. I love all forms of needlework, and usually have projects going in at least 3 or 4 different types. I am totally intrigued by this Whitework, and would love to learn how to do it! I love to do white works. It is fascinating to see what can be done with different types of thread an type of embroidery. the result is always beautiful. Most of my experiences have been with counted cross stitch,I would have difficulty choosing a favorite needlework method,as I love them all.My fingers are crossed with each generous give away,Thank You. My favorite form of needlework is canvas. I enjoy using different threads and stitches and like the holes to know where to put my thread. I love basic embroidery because I know how to do it. I would really like to expand my stitch knowledge (love your videos & stitch play ideas!) so that I can be more creative and make different projects. Thanks for the opportunity to win a great book. I love French Handsewing (by hand not machine). I get lovely garments, it incorporates embroidery, and is very relaxing. What is my favourite type of needle work? That is very hard to say as I really enjoy almost anything. I do not like cross stitch as I cannot count past 4. I have done brazilian, counted work, white work, black work, pulled and drawn thread gold work, silk shading, crewel, canvas work. I am currently obsessing on white work. I love the look of Italian white work since seeing the current edition of Inspirations magazine. As I am mostly self taught a good book is invaluable to the learning process. Thanks for this opportunity. My favorite kind of needlework is any type of hand embroidery. I love all the colors available to use. Not too fond of machine embroidery even though it is pretty too. But yes, I love hand embroidered pieces. I can remember my mom doing this when I was a child many years ago. My mother taught me to embroider when I was eight years old…it’s still my favorite hobby. I’ve done it all, quilting, tatting, crewel, rug hooking, etc. I love to crazy quilt and use evry type of stitch and thread I can get my hands on to embellish. Embroidery is my favorite because it’s used in such a variety of ways….whitework, heirloom clothing… Baby clothes are my favorite things to embroider! i would love this book, so thank you so much for another chance to win it – my favourite stitchery at the moment is freehand – my last project was to decorate my DGD doll’s cot blankets!! My embroidery career started embroidering my own doll’s cot sheets when I was about 5 or 6 – I am sure I was the only one who knew what the ‘pictures’ were though!! I love all types of stitchery, and this technique looks fabulous. Another great giveaway! My favorite type of needlework is Hardanger embroidery mostly because of the challenges & the fear of cutting the wrong threads for the openwork. I am full blood Portuguese and would LOVE to have this book. The work looks beautiful and I would love to learn how – please pick me! My favorite form of needlework is hand embroidery, done mostly on the crazy quilts that I make. Dear Mary, this is wonderful and a thank you to Yvette, I already have her’s and Prue Scott’s book on Mountmellick and really enjoyed teaching myself how to do this work from their book, the instructions were very easy to follow, I saw Portugese whitework at a craft fair and thought it was lovely, and would really, really love to teach myself how to do this style of embroidery. I have several other of Yvette’s books. They are beautifully written with clear directions and I would love to have this one too. I enjoy various types of needlework, generally my favorite is what I’m working on at the time. Currently, it is canvas work, I’m relatively new to canvas work so it is new learning. I have a Schwalm Embroidery piece ready to start so that will mostly become my favorite. I think that my preference changes because I enjoy the challenge of learning something new. My favorite kind of needlework? Gosh, that’s not an easy question at all. It depends on the day…canvaswork, whitework, samplers, stumpwork, temari…I love them all! But just for the sake of this book, I’ll keep it relevant and say whitework is my favorite for today! A favorite style of needlework? How can I choose…I love every one I have tried although most often I have done crewel work and sampler embroidery. I just recently stitched my first blackwork piece inspired by Tanya Berlin’s mini mystery project and am hooked on blackwork as well. Love to try and learn about new stitching. Just need to add several more hours to the day to attempt to do all I would like to do! My favorite type of embroidery is anything that falls in the category,” Counted Work”: cross stitch, blackwork, hardanger,pulled thread, drawn thread. There is something reassuring about the faithfulness of numbers! My favorite type of needlework is hand embroidery. There are no restrictions in hand embroidery. You are free to make your own design or use available patterns. You can be creative in the design and choice of colors, in addition to the creativity involved in utilizing different stitches for different effects. Hand embroidery can be completed on practically any available surface, and it is as portable or stationary as you care to make it. While other needleworkers may be able to say all this about their favorite needlework, for me it is hand embroidery. Thank you for another opportunity to win that lovely book. My favorite form of needlework is cross-stitch on linen. I guess even though it’s hard to decide I have to say that Silk Ribbon embroidery is my favorite of the needle arts to do. I like Brazillian Embroidery allot too. Thats why I would love to win this book with all of it’s boulions. this book certainly interests me as I am pretty much a beige-ee whitee— lite color lover….and RED! lol…I want very much to tackle something red and white…I don’t think I have a real favorite yet…I do many types of stitches, but there are OHHHH SOOO MANY I havent even tried as yet…but ty for asking! luv your blog! That’s a tough question since I love so many different forms of needlework! I always love learning new techniques but if I must choose, I’d have to say that my favorite is hardanger. I have several of Yvette’s books and they are awesome with wonderfully detailed instructions and pictures! I love all types of needlework. My Mother taught me basic embroidery as a young child. I love the thread and many colors to make flowers. Later my Grandmother was making needlepoint covers for chairs and I had to learn how to needlepoint. She also made me a needlepoint pincushion with my name on it. And later still when cross-stitch was very popular I did many projects as wedding gifts using cross-stitch. I have also enjoyed crewel embroidery and hardanger more recently. I am taking an EGA correspondence course in Schwalm whitework. I am making the piece on very pale yellow (fabric from my stash), I think it will be pretty. I would love to learn another kind of whitework, Portuguese Whitework. So much beautiful needlework to learn from all over the world. My favorite is anything stitched. I love to learn new techniques and stitches and am slowly working my way through different types of needlework. I have learned Hardanger and Schwalm Work. Portugese Whitework looks interesting and fun to try and also master. I tell my grandaughter’s that I am creating heirlooms. I would very much like to win this book for my library. I would love to win this book. I’ve done a lot of crewel and cross-stitch but I’d really like to try goldwork. wow, give away spree going on!!! I love love love whitework, I just finished a project, actually I did it in white and light grey, I wish i could send a pic but don’t know how. At any rate I would love to win this book as I intend to concentrate on whitework for the next year. It just fascinates me with its subtle pure presentation. Thank you for all your inspiration Mary. My favorite type of needlework is still evolving. I can say that it is the kind I am doing at the time I am both learning and creating. I am learning new things every time I sit down to work. I love this form of creativity in all its manifestations, and have practiced various kinds of needlework. I am currently working in crewel and needle painting. I would love to learn more about the beautiful white work because it is amazing to contemplate and seems beyond my abilities. If I had a book on the subject, I think I would love to try my hand at it. I am self taught for all my efforts except sewing. my favourite is bullion stitch, i am newly in emroidery . bullion stitch is dificul but look soooooooooooooooooooooooooooooo perty. if my name will not draw ,nevermind i will buy , please tell me in which country you live,thanks gul from pakistan ,karachi. I would love to win this book, as it will not be available in South Africa for many months to come…. My favourite needlework is Mountmellick which encompasses so many techniques of surface stitching. Different threads give different effects. I love it. I love hand embroidery so much. Would love to win this book and to learn Portuguese Whitework. This book looks so excellent. Thank You for offering this!!! my favourite embroidery is wool work but i just love any surface embroidery and embellishments i would really like to try Portuguese whitework and from your review this looks to be a very good guide and instruction. Mary, I decided some time ago that I don’t have a favourite type of needlework. There are so many which I enjoy doing! Whitework, surface embroidery, counted thread, stumpwork, goldwork – how can one choose just one? White work. It is simply beautiful and useful. It also spells luxury and pampering( bed linen, table linen and clothing)and takes me back to my childhood where there were no man made fibres! My favorite stitching is any type of surface embroidery. The subtlety of white on white is especially elegant. After reading all of then names of the many different types of embroidery everyone does I’m thinking a stitching retreat where people bring their UFO’s would be fun just to see the different types of stitchery that we all do. Does anyone know what twilling is? A friend of mine asked me about it, but I am clueless. Supposedly it is some type of whitework like candlewicking. There is nothing simple about choosing a favorite type of needlework! I love so many, and especially combinations. When i saw the book, i had some ideas for a summery tablecloth. Maby that could be the next project? Hi Mary, My favourite embroidery is usually the piece I am working on at the time. Right now, I am doing a project for a course. It uses bullion knots – lots and lots of them! I have come to love these little stitches sooo much and I am already thinking about what I could use them for next…. and lo! – Portuguese whitework and Guamaraes. It looks so enticing, if a bit daunting – but this book would be there for me every step of the way. I do not have a favorite type of needlework, it all depends on how I am feeling and how much energy I have. When I have worked hard the whole day and I want to relax, I do my counted crossstich. When I have a lot of energy I like to do embroidery that calls for more brain-activity: free embroidery, Schwalm, canvaswork, whitework …. and making teddy bears! To let everyone know, you can Pre-order Portuguese Whitework from Nordic Needle at http://www.nordicneedle.com. For $29.99. You can also buy the Left and Right-handed embroidery Companion books. I don’t remember their prices. I ordered one of the right-handed ones and am going to get the book for left-handlers for my sister. I love Whitework of all kinds. It is always so simple and fresh-looking. It always reminds me of days gone by, of a much more simple time. If I don’t win the book, I will definitely Pre-order it from NN. My favorite kind of needlework is counted cross, because I find it so relaxIng to start with a blank piece of beautiful linen and luxurious silk and transform it into a work of art. Counted cross is so much more than just making crosses. We have Algerian Eyelets, Long Arm Cross Stitch, and the ever perplexing Montenegrin Stitch! If you can master that stitch, you have arrived! I love to stitch 16th and 17th century reproduction samplers. When I stitch one, I try to think of the young girls that stitched the same thing I am stitching, only about 400 years ago! I really hope to win this book so I can expand my needlework projects to go beyond the world of cross stitching and learn a new skill. Thanks for another chance to win this book, Mary. I prefer regular embroidery for the variety of stitches that make it so interesting! Oh please “needlework Angel” help that I get this give-away. I love Whitework, and what a beautiful form of needlework Portuguese Whitework is. I didn’t even know that this form existed, until your review of the book a while back. I would very much like to try this. Its simply stunning! My favourite needlwork is stumpwork goldwork and whitework with ecclesiastical embroidery catching up fast. funny how one tends to stick to what you know and like and being wary of trying new avenues. Owning this book will definitely do the latter. I don’t think I have an absolute favorite type of embroidery. I do a lot of hardanger and thread painting. I currently have two projects lined up, one is blackwork and the other is goldwork. A favorite???? Each type of embroidery has it’s own beauty for us to learn and enjoy. That’s my favorite thing about embroidery, there is a type for everyone. Hello Mary, maybe this time I’d be the lucky one :)? I love Hardanger because I love how it looks. There’s some counting involved in it and I was good at maths in school, so maybe that’s another reason :). Cheers! What a beautiful embroidery. I’d love to try this one. I love hardanger and see some similarities. I am really intriged by this form of whitework – so much so that I tried to get my local bookstore to order this book in. Apparently it is unavailable. I really love bullions and the combination of some of the elements used in Portugese workwork is definitely something I really would like to try. Whether I win this book or not, I do hope to get my hands on a copy in the near future. 🙂 Thank you again for this great opportunity and for your generosity. I love handwork, but don’t do as much anymore. I have taken quite a few classes from the Martha Pullen School of Art and learned so much from the various teachers there. I am not sure what the type of embroidery that I have done is called….I just love the different stitches and am amazed the way a stitch changes depending on the threads used. My favorite type of embroidery is definitely white work together with pulled thread work. I just love the lacey effects they produce. my birthday is the 16th so maybe I will get lucky and win this fabulous book. It’s difficult to tell you what is my favourite type of needlework,I enjoy so many type of embroidery. At this moment , I love most japanese embroidery (it is so neat and the silk threads are so beautiful) and crewel and jacobean embroidery (I love the drawings). I enjoy embroidery the most, but I have just starteda cross-stitch project which I am finding somewhat challenging. I probably should have started with a printed pattern rather than a counted x-stitch. In any case it has interested me in trying new things. This book would be a fabulous addition to my needlework library. Thanks for all your informations here …. is a very usefull library online e better … for free!! I adore portuguese whitework!! !Ilove to do simple things ,I learned a lot with you Mary ! !My problem is that internet iss not very good here ,and I am bad with technology ,kids are all married and gone ,have no one to teach me .I don’t even know what website means .?? ?ha ha I’m olga from Argentina !!! My grandma Claypool taught me to embroidery when I was a little girl and would visit her in the summertime. Many patterns were stamped on dishclothes and the adventure began. Simple chain, lazy daisy, backstitch and stem stitches were used. As an adult now, I marvel at her patience with me when I constantly had knotted thread and the needle slipping out all the time. She was a gem and also taught me how to crochet around a pillowcase edge. Although I have done counted cross stich and crewel, I still enjoy prestamped embroidery that’s so convenient to take anywhere and work on it for an hour or fifteen minutes. I’ve only recently subscribed to this great website and I can’t wait to try some new stitches. Great inspiration! It is difficult to say which type of needlework I like the best. I like needlework at all, all kind of it. Few years ago it was cross stitch, last year it was beadwork. I love silk ribbon embroidery very much, it my favorite this year :)) it is because my new project is with ribbons. It’s difficult to name a favorite type of needlework. Often favorites become exactly that because I’ve gained knowledge of the type, viewed pieces executed in it, and gotten to “know” it. Favorites also depend on a piece that I might be planning, and what is required for the finished piece. The skill of the embroiderer must also come into play. The more I learn and study surface embroidery, the more there is to love about each and every type of needlework. The top of my list would include Ecclesiastical embroidery, and whitework, with many others following close on their heels. I enjoy needlework of all types and I like to learn new stitches and challenge myself. I admire Whitework of all types and would love to learn more about it. But I always seem to return to counted cross stitch, so I guess I’d have to say that is my favorite. I love cutwork. Hard to come by patterns. I search on Etsy shops and vintage pattern shops online for old transfers. Then I trace them and use a better way to transfer my design. If you want to do it, you have to love doing the buttonhole stitch. I would like to try some different whitework. Thank you so much for the chance. I would love to delve into this kind of embroidery. My favorite “thing” right now is Hardanger. I have learned so much since I started to receive your newsletters. My favorite type of needlework is goldwork. I enjoy and love the results of all the other various neelework forms, as they each have a certain beauty of their own. But nothing is as beautiful, breathtaking, or gives greater honor and glory to God as goldwork done on a vestment used at the Holy Sacrifice of the Mass!!! I would love to be entered into the give-away for this book. I love surface embroidery of all types. I started with jacobean crewel as a little girl in the late seventies and have progressed in fits and starts from there. Right now styles I have tried include, crewel, goldwork, freestyle, Mountmellick, silk shading, Hungarian and Unkrainian and needlelace. I love the more complex stitches and love to do knots and prefer surface to counted forms, even though I love the way other people’s counted work looks. Thanks for a wonderful site and so many great give-aways. To pick a favorite? I have been doing counted work – cross stitch, hardanger, pulled thread, canvas work – for so long. I’m just now starting to venture out into other forms of embroidery so I don’t have a wide range to compare to. But so far my favorite has been temari. So different, and so much fun! My favorite type of embroidery at the present time would have to be a tie(Stumpwork -Whitework. )I love the dimensional effect of stumpwork,so realistic and the openwork and raised effect of whitework.Would love to try the portuguese whitework-looks fabulous. My favorite is any type of surface embroidery. my favorite type of needlework is satin stich, because i like the feeling of thickness it makes, that heavy and rich feeling, especialy if bright colours of threads are used. i am a begginer and I don’t know many stiches but satin is my favorite now. I would love to learn many styles of hand stitching which includes other cultures. This book you’re giving away has me so intrigued. I would love to learn what’s in it. I am in charge of teaching young quilters hand stitching and I am in awe of how they learn and how much they want to know. This book would help immensely. I loved learning the Palestrinia stitch from you and I’m teaching it to these young ones. They are also being sent to your blog. Thank you for what you’re sharing. I’m working on a full size crazy quilt and am having the time of my life.The chance to use so many types of patterns, stitch and color combinations is exciting and rewarding.I won’t be done soon (it’s my biggest project to date)and I like to take breaks and work on smaller projects.I like to broaden my knowledge and would like to learn about whitework. I love the clean look and can imagine many kinds of small projects I would love to do.Whether I win or not, I’ll be looking into this technique more. Bullion knots is my favourite technique. Congrats for this perfect review and amazing give-away! My favorite form of needlework is petit point done on loose linen – I love geometric forms in thread in a monochromatic pallet. The color does not matter – they are all beautiful. My favorite type of embroidery is needlepoint. I have a lot of trouble with tension, and I find that the canvas helps to keep me on track. I have noticed that my tension is beginning to improve, so it may be all the practice with canvas that is finally having some effect. Thanks so much for this giveaway–my maiden name is the same as the city across the bay from Lisbon, so learning Portuguese embroidery would be a real treat. I don’t really have a favorite type of needle work, what I like is that there is so much of diversity in needle work, so you never get bored! I do have a crush on anything that has a white background, not only portuguese whitework but also any kind of redwork with a white background! Embroidery on crazy quilts… love it. Is there no end to wonderful white work styles? Funny enough, I love doing blackwork! I enjoy working on 17th century samplers the best but also enjoy doing surface embroidery. My favourite type of needlework is anything involving cut & drawn threadwork. My absolute favourites are punto antico & reticella as I love the challenge of cutting & withdrawing,the simple pleasure of preparing the foundation, and the joy of needleweaving & surface stitches,the final glorious stage. That question is easy for me to answer – embroidery, hands down! Wow! What a beautiful book! Whitework and cutwork always remind me of my gramma’s dresser scarves and other things she made when I was a kid. Surface embroidery is my fave needlework. Been stitching since I was four years old. Thanks for the chance to win! Gosto de todo tipo de bordado e muito de patchwork. Gosto muito do site Mary Corbet’s e adoraria ganhar o livro Portuguese Whitework. Estou aprendendo muito, navegando no site. Muito obrigada. This is such a great book. I’ve looked at it, but don’t own it. But would really love to. I use to correspond with a lady in Ireland who taught Montmellick. I have done some and recently finished a work that should have been white, but did it in soft pink and added pearls. It wasn’t my pattern, but I really enjoyed doing it. I do several types of needlework – cross stitch, applique, and stitch play (thanks Mary!). I just can’t pick a favorite, but my favorite cloth is linen and cotton threads take up the biggest part of my collection. Bullions are one of my favorite stitches and can be done beautifully in color (for roses) or in white as in the book. I would love to have a copy. Thanks for the offer! I still have a lot of needle work I haven’t touch yet, however so far my favorite is Shwalm, so many different filling stitches. and I love the look of it. Thank you for organising another wonderful giveaway. I do not have a favorite type of embroidery at this point, though I am enjoying learning many new stitches to incorporate in my needlework. Your site has been an exciting find for me, and I love your tutorials and inspiration. A wealth of information! Thanks for all. Hi Mary! I really enjoy doing crazy quilt stitches with silk buttonhole twist. My other fave is Elizabethan-style stitching, which I am gradually learning. Thanks for a fun book giveaway! I really enjoy any kind of hand embroidery-both to look at and(as far as my attempts have gone) to produce. I have not attempted any Portuguese whitework, but I am sure I would enjoy the opportunity to learn. I love the simple elegance of whitework. I haven’t done an official project yet, but this book looks beautiful and inspirational! Would love to be the proud of owner of this fine book. Thanks so much for offering. Love embroidery work…it gives me a chance to be creative, and it allows my sewing to evolve. I love counted cross stitch, but have started to do more embroidery pecies. Always creating new designs, and using different stitches is what makes it so enjoyable for me. Gosh, this was a hard question!! I love many kinds of needlework, love specialty stitches which I am gradually learning. I envy you Mary for the evenness of your crewl and satin stitches, the medallion project was incredible and a treat to watch your progress. But if you ask my favourite, I would probably have to say needlelace. And the reason, well, I love bobbin lace and needlelace looks so lacy too, I am part way through my first piece of Zele lace and am really enjoying watching it develop. And I hope to design my own needlelace patterns one day!! My favorite is whitework. It’s wondrous how the combination of a single white thread, with many stitches, snips and wraps, can transorm a plain woven background into an image that invites the eye to linger. I love hardinger. I am a database admin by profession so that should tell you about my ease with and desire for order and exactness. To me, hardinger has all of that plus allows for a creative outlet that results in a work of art that is quite beautiful. So it’s very pleasurable to work with it. It also combines my love of counted thread, white work, and withdrawn thread work. Love embroideries of all kind! My favourite type of needlework is crochet, though. My favourite form is blackwork but also enjoy hedebo, canvas and hardanger. we recently did a course in our guild of Romanain Point Lace. I’d enjoy this book which offers a new stitching challenge. I love Hardanger embroidery and cut work! This book looks awesome!! Thanks for the chance. I like plain old embroidery because it is relaxing but mostly because it reminds me of my mother who taught me how to do it when I was 4 with a big needle, blue yarn and a pencil drawing of a daisy. Gotta’ love redwork! I’m always on the move, so doing work in one color is handy–and red is my favorite color! I’m a cross stitcher. But I love other needlework techniques too, recently I wanted to try Richelieu embroidery because I found it fascinating, however my project turned out as a Broderie Colbert piece. I’m not well versed in the different types of stitching. I only just started crafting, and only have enough time to sew 10 minutes at a time. I am interested in learning to stitch though. I can sneak in more time to do something fun that way. My favorite needlework form is counted cross-stitch. Been doing that for *years* but something crazy pretty like this would be a wonderful change of pace! Thanks for the chance to win. I am barely learning how to crochet and work with needles. I love to see the embroidery especially on napkins since I like to use them to cover up my homemade tortillas, in Mexico that type of embroidery is called “bordado”. That is my most favorite type of work because you end up losing yourself into your peice of artwork, you get to use all those beautiful colors, and at the end I show off my masterpiece when we eat! While I love all types of embroidery, whitework and cutwork are what always make my heart do that pitter patter of excitement. I love the soft, timeless feel. After reading your review and looking at the pictures in the book, I know I would love to have it. Whitework is a technique I have not tried. The book would be a nice addition to my library. My favorite needle work is knitting but I really want to get back to embroidery. I would love to start doing Portuguese Whitework. Thank you for the great giveaway! All white embroidery is so beautiful. I have a piece of white embroidery from a pillow I had as a child with my name on it. It is one of my favorite memories! I love to embroider by hand and have always loved the look of redwork! I love all types of embroidery, but my absolute favorite is crewel. It is so much fun to take a plain design and change it with different types of stitches. I enjoy browsing my books and magazines to get ideas. Sometimes it takes awhile to figure out what I want to do, but then there is that aha moment and I get started embroidering my project. The Portuguese Whitework is beautiful and I would like to join the rest of the ladies for a chance to win it. What a great giveaway. I love white work. Thanks a lot for the giveaway. So my favorite is redwork, in my country we usually made a traditional stitches only, some few make differents stitches. My favorite type of needlework is canvas work. But I do enjoy all types. I’m just learning to embroider and am loving it. I’ve always crocheted, but embroidery is what I’m these days. Thank you, Mary, for the chance to join your generous give-away. It must be hard to choose one from amongst so many deserving ladies, but my heart skipped a beat when I saw this book because I am completely enthralled by whitework embroidery. I find it utterly fascinating that with the ingenuity of women across the world, these same two basic materials: white fabric and thread can be manipulated in a seemingly endless variety of ways. I have enjoyed learning both pulled thread and drawn thread techniques, but I know I have only scratched the surface of these beautiful forms of needlework. I would love the opportunity to try Portuguese Whitework with it’s intriguing mix of openwork areas and surface embroidery. Having coped with the same illness as Yvette Stanton, I am so inspired by how she has overcome this difficult condition to create such beautiful work and also by knowing that we have the same love for wonderful whitework embroidery. My favourite type of needlework is cross-stitch because the results are perfect every time. Que oportunidade maravilhosa, quero muito participar. Voltei… me empolguei e esqueci de comentar sobre meu trabalho preferido que é o bordado em ponto cruz , mais sempre que posso me aventuro em outras ´costurices`. My favorite type of needlework is hand embroidery. I started out with the cross stitch craze but only doing a couple types of stitches got boring. I love making french knots and lazy daisy chains, outline stitches. Your blog is like Pandora’s box because when I open it to read, there are so many stitches I have never heard of or tried. I want to advance to cutwork so I can make napkins and a tablerunner. Thank you for sharing your talent and knowledge with us. I’m not very good at needlework but I enjoy having a go at embroidery. I don’t know much about Portuguese Whitework but would love to have a try. I like machine embroidery, I love to sit and watch the picture appear. I’d love to add Portuguese Whitework to my repertoire! Oh i love this embroidery work. I would love to learn how to do Portuquese White work. It is so gorgeous. I love, luv, looooove you newsletter, always so informative, I would really LOVE to win. Thanks, Sally D.
Hi Mary: Thanks for the great giveaway – it’s always a joy to add a new technique to the repetoire (and library). My favourite technique is whatever I happen to be working on at the time – from hardanger through rug hooking – I love it all! I enjoy counted cross stitch most. My grandmother taught me this when I was a young child. Whenever I’m sitting alone working on a project, I think of her and remember the long talks we used to have when sitting on the back porch, working on our cross stitch projects together. My favorite form of needlework is Hardanger. I’m of Danish descent and yes I know this is a Norwegian needlework. It’s in the blood I believe, lol. I just love how Hardanger looks, before and after cutting. All types of whitework – I love the detail and precision involved. At the moment my favorite is traditional Lithuanian whitework and I want to try more types of it. So this book would be a great help to me. Thank you for this give away and good luck for everyone. I really enjoy cross stitch and someday hope to have enough patience to learn bargello. Thanks for the giveaway. The book will be well used. I would love to have a book on how to do this beautiful technique of whitework stitches. Thanks for the opportunity to win. Well, I’ve never done needlework before, so I guess it’s all my favorite. I just found the website and I’m fascinated by it. I love embroidery taught to me by my Portuguese grandmother. I love all kinds of white work, particulary Hardanger and Casalguidi. Love Yvettes work and would like to try Portugese White work. My favorite embroidery right now is Mountmellick! Just because it’s relative new to me. I love all kinds of embroidery but I have never had the opportunity to find out about Portuguese Whitework and would love to be able to find out how to do it. My favorite needlework is a cross stitch because it is a pleasant way to spend free time and make friends.I still have not learned the embroidery of Guimaraes and if I win the book will surely be my greatest challenge to learn this technique! I find needlework so interesting & beautiful that I can not pick one favorite type it is all my favorite. The detail & stitches that go into a type of needlework is amazing. The time that is put into a piece of needlework is very rewarding when you see the finished piece. I have done counted cross stitch and embroidery. There are so many things to learn. The book, Portuguese Whitework would be great to have to learn more about the world of embroidery. I just love all types of needlework new and old. Thank You So Much. I love counted cross stitch but would love to learn this new technique. My current passion is embroidery with beads and sequins with my favourite stitch being the chain stitch. It would be great to win this book as it would introduce me to white work which is something that I am not that familiar with. I am currently having a ‘go’ at Broderie Anglaise after recently purchasing a book titled ‘Sewing Techniques’ by Dorothy Wood. Thanks for the opportunity to go into the draw. I loved this book when you reviewed it and am so glad to see you have another give away!! I love cross stitch, especially when it has specialty stitches. But I am always up for trying different types of needlework!! I appreciate all the needlework you expose me to. Trying to pick my favorite type of needlework is like trying to pick my favorite sweet treat. I love Hardanger, blackwork and Assisi work. When I work on these types of pieces, I feel a connection to the past. I used to do historical re-enactment and loved that I could indulge in 2 of my favorite hobbies at the same time. I haven’t tried Portuguese Whitework yet – looking forward to learning something new. I cannot decide between counted techniques such as blackwork and bargello and the lovely textures of candlewicking and free-form surface stitching. Portuguese stitching appeals to both sides of my embroidery debate, so I would love to win this book. Thank you Mary and Yvette for giving us this lovely opportunity. I love to Cross Stitch. Have been doing so for 35 years. well, right now it is definitely embroidery…i am loving the freedom of it…pick my own patterns, threads, backgrounds, stitches…i am making it mine! i have grand plans to embroider my jeans this summer! I want to learn more about beautiful white embroidery techniques. Thank you for the opportunity.